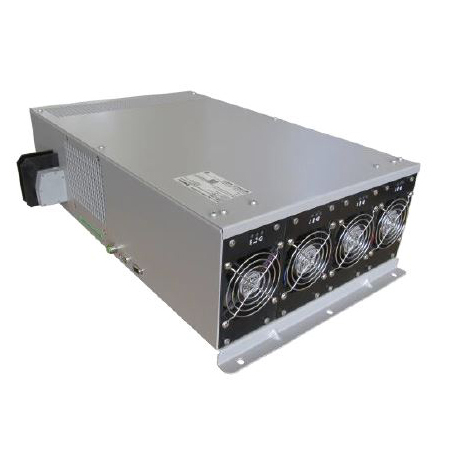 The LBC series is a ruggedised battery charger consisting of two or three parallel independent AC-DC converter modules employing PFC stage and insulated DC-DC stage to convert the three-phase input voltage 400 / 480 VAC to a bus voltage suitable for 110V battery charging. The DC-DC stage to converts the 3-phase input voltage to a bus voltage with battery charging capability. Emphasis is given on high reliability and long life. Two or three parallel independent units inside the shelf with active current sharing are used, which safeguards reliability and partial redundancy of the system. the shelf controller and to the external supervising system. External communication is provided by either CAN or Ethernet communication.